7 Best Snare Drums For All Styles of Music! What is The Best Snare Drum? My top recommended snare drum is this superb Ludwig Black Magic brass snare drum with a powerful 8” of shell depth. Everything about this drum is sensational. It has been built to deliver tight, crisp projection with huge full-bodied attack. This fantastic drum brings the same signature sound and quality as its bigger brother- the iconic ‘black beauty’. Ludwig pioneered the black-nickel over brass shell in the 1920’s and set an unchallenged benchmark in quality for all the drum manufacturers. This drum delivers a classic tone that is famous around the world and has been played by some of the greatest drummers ever. Ludwig has pioneered a warm, round metallic tone with the black beauty that is often imitated but never duplicated. To play this drum it is truly astonishing. It sounds bright and open but also full-bodied and warm. It has a lot of body thanks to the 8” of shell depth and the brass shell offers a lot of weight and attack. This drum suits every tuning range, all the way from low to high. It has a lot of vintage depth tuned low and it really pops tuned up high. This drum accommodates 10 beautiful looking tube-lugs as well as matching die cast hoops. The best part about this drum in addition to the incredible sound is the unbelievable price. It truly does represent excellent value for money with the quality of this snare drum that you receive for the price. I thoroughly recommend this Ludwig snare drum to anyone on the market looking to upgrade to a versatile, well-balanced snare drum that sounds fantastic across most musical genres. It really is the best snare drum for its price. Up next we have an iconic snare drum that is genuinely one of the greatest snare drums in history. This Ludwig Supraphonic snare drum has been played on countless hit records in history ever since the 1960s with its distinct bright and crisp sound with the perfect balance of snare crack and resonant tone. I have played several of these drums and each one sounds just as good as the last. The seamless aluminum shell provides a dry but very sensitive tone and it has a great balance of frequencies across the range. This drum also sounds delightful across all tuning ranges from low to high. This Ludwig Supraphonic snare drum is perfect for use across all styles of music; it is a hit amongst jazz professionals as well as the heaviest metal hitters. It sounds remarkable on stage as well as in the studio. This drum will fit well in any style of music and it is a drum that is built to last. This drum features high quality and durable chrome hardware as well as 10 classic Ludwig imperial lugs for consistent and reliable tuning. I would recommend this drum for any drummer who is looking for a seriously high quality snare that simply sounds remarkable and delivers an incredibly high level of performance. DW have really delivered a great product with this particular snare drum we have up for review. DW are renowned for creating high quality drums and hardware, and this snare drum is no exception. This snare is comprised of a 1mm, bead-reinforced, all brass shell that has been crafted with care and precision. It is a seriously good sounding drum. What I particularly like about this snare drum is the MAG Throw-off, which is efficient and classy. It makes turning the snares on and off a breeze and it is silky smooth in operation. True-Pitch tuning also allows this drum to sound great consistently for each performance. This drum contains all the signature quality of the high-end DW drums but at a fraction of the cost. After setting the 10 lugs to a medium tuning this drum really opens up with a fantastic tone and projection, and produces a thick and lively backbeat. It is highly responsive and sounds great with subtle ghost notes all the way to explosive rimshots. Its versatility means it would be a perfect upgrade and will deliver years of fantastic sounding performances. Next on my list is this gorgeous Mapex Black Panther snare drum, the Sledgehammer model in its lineup of high-end professional Black Panther snares. This model is 14” in diameter by 6.5” deep and it has been constructed from a 1.2mm hammered brass shell, which really does cut through the heaviest walls of sound. It features 10 gorgeous tube lugs and Mapex’s Sonic Saver hoops all in a matching brass finish to complement the drum. This snare has a distinct bright and focused pitch as well as a well-rounded tone. It’s a heavy drum, and it is loud to say the least. It has a sharp attack and provides excellent and aggressive rim shots that are so satisfying to play. This drum produces a good level of low frequencies as well as high frequencies that really ping thanks to the high quality hammered brass shell. The Mapex Black Panther range of snare drums offer excellent build quality and have heaps of projection at a reasonable price. This particular model sounds fantastic across a variety of tuning ranges especially when it’s tuned up high. It is suited best for rock and metal but it has enough dynamics and responsiveness to make it suitable for pop and blues also. This fantastic and affordable snare drum made by Yamaha is a joy to play. It is made with an all-birch shell and features 45-degree bearing edges as well as 10 lugs for precise and accurate tuning. It is rare for snare drums of this price to feature this number of lugs, and it is a testament to the quality of this drum at this price. The birch shell of this snare drum provides lots of bite and high frequencies. It really pops when it’s tuned up high and has a crisp attack that just sounds great. Birch is a popular wood used in high quality drums and produces a bright tone. This drum is also offered in 5 stunning high-gloss lacquer finishes which all look fantastic. For its price this snare drum does really does deliver. Yamaha has upgraded the shell construction to the same thicker ply concept used in its high end series of drums and this drum provides Yamaha quality at great value. This snare drum we have here is a stunning all-maple snare drum produced by PDP, an offshoot of the DW Company. This snare drum even features all-maple wood hoops for an authentic vintage look. The all-maple design gives this snare a real crack and it sounds delightfully mellow. Upon first inspection, I was really impressed with the quality of the construction of this drum. It has been made brilliantly and it possesses a deep and rich tone. This drum sounds especially good in the low-mid tuning range, where the wood hoops really help draw out a vintage sound from the drum. Just like the DW Design Series Brass Snare Drum, this model also possesses the innovative MAG snare throw-off. This is a really nice addition to this drum and allows for smooth transitions between having the snares on or off. The only downside of this drum is that it features 8 lugs instead of 10 which isn’t representative of a high-end drum. This snare drum comes in a very nice and subtle natural wood lacquer finish that I think looks really attractive. The wood hoops complement the natural finish brilliantly, and the whole package looks and sounds superb. The price for this drum is also highly affordable and reflects great value for money. 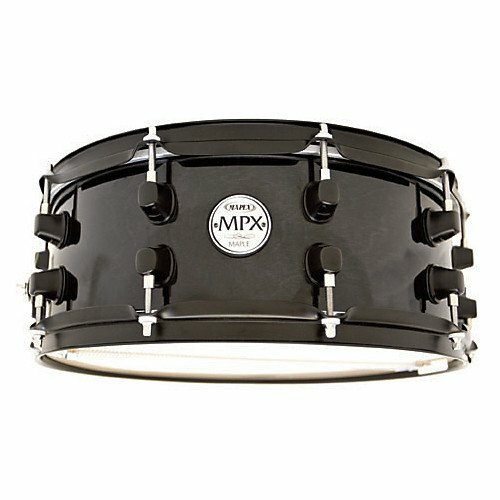 Lastly we have an affordable yet well built snare drum made by Mapex Drums. This snare drum is not the same league as the Mapex Black Panther Sledgehammer Snare Drum we reviewed earlier, but it does deliver good performance for its affordable price range. This snare drum is comprised of a 5.1mm all-maple shell, which is a desirable wood for a drum of this price. It delivers a warm tone and the sound is open and resonant. The drum delivers a clear attack and projection and it does perform especially well in the mid-high tuning range. I personally find the high gloss ebony finish really attractive on this drum, and it’s adorned with chrome-plated triple-flanged hoops and chrome plated lugs. This drum also features Remo drumheads and a 20-strand snare wire that delivers a lot of crack for hard backbeats. It also features 10 lugs for precise and even tuning across the drum. Overall this drum is a good option for an intermediate level snare drum and its maple shell delivers a good level of performance across the board. It’s got enough crack to sound good through most styles of popular music and it is constructed well to deliver solid, reliable use at a really attractive and affordable price. The snare drum is the most distinctive and defining part of the whole drum set. It is the greatest tool for a drummer and it sounds great in every genre and style of music. The snare drum rests in between a drummer’s legs for convenient access- it’s the most important part of the entire drum set. 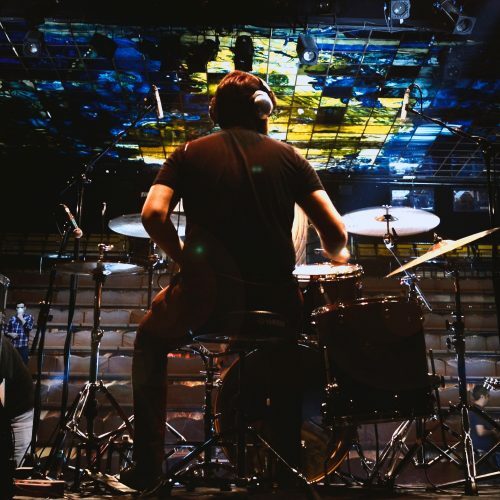 A drummer’s snare is the most played component of his drum set and will define his musical voice behind the kit. Each particular model of snare drum has its own characteristics that project a unique musical tone. There are a lot of defining features to a snare drum that will contribute to its overall sound. The backbeat of the snare drum delivers the groove to all styles of music, and keeps the music driving forwards with energy. It is this musical heartbeat that provides the rhythm and makes people dance to all styles of music whether its disco, rock, pop or blues. Naturally, you will want a fantastic sounding snare drum that delivers across every area and is versatile enough to sound great for different musical genres. There are a lot of snare drums on the market, but in my list I have gathered the best 7 available on the market right now that perform great across different tuning ranges and at different volumes. There are a lot of varieties of snare drums, with entirely different shell constructions and sizes. Different shell materials contribute massively to the snare drum sound, and offer the drum its unique character. Generally speaking, the more you will spend on a snare drum will reflect the quality of the construction and build materials. But there are definitely excellent, affordable snare drums on the drum market too. Multi-ply wood shelled snare drums dominate the drum market. They are versatile, warm and have great projection. Wood snare drums are highly popular because of their great characteristics as well as the fact they are able to come in a great range of finish options including classy lacquer finishes and bright wraps. Wood shell snare drums come in a variety of wood types. The most popular and common woods for high quality snare drums are maple and birch. Maple is well known for high quality snare shells. It has a warm tone and a lot of projection and good low frequencies. The sound is clear and concise and it sounds great across all tuning ranges. Maple snare drums make great all round performers. Birch is also a very popular wood used for snare drums. Birch has a brighter tone and it has great high and low frequencies that produces a fantastic, crisp sound. Birch snares also make highly versatile snare drums. Oak and beech are also wood types used for snare drums, but are not as popular as maple or birch. Nonetheless, they have good qualities that make them great alternatives. Oak is a very dense wood and offers fantastic durability and projection. It also offers a well-rounded tone. Beech is a similar wood to birch, but offers a slightly warmer tone and adds a bit of extra depth to the sound. Solid stave wood snares are becoming increasingly popular, but these are custom and very expensive types of snare drums made by custom snare builders. They are constructed from a single stave of exotic and dense hardwoods such as mahogany, walnut, zebrawood, padauk, jarrah and more. The other commonly used type of material for snare drums is metal. Metal snare drums have a bright and metallic sound with a lot of projection and are excellent at cutting through the sound of other instruments. They also have complex overtones that add to the attack of the drum. Steel snare drums are the most common type of metal snare drums available. Steel is generally the cheapest type of metal used for snares, and makes them a good option for mid range snare drums. They possess great sound characteristics including a bright open tone and a lot of projection and sustain. Brass snares are very desirable and have a warm, mellow tone with a lot of clarity and projection. Brass snares are very heavy and this weight combined with their clarity provides a fantastic level of attack. Aluminum and copper are less common types of metal snares but they are also great sounding drums. Aluminum is a dry sounding metal, and offers less sustain and it is also very sensitive. This snare sounds excellent in jazz, funk and pop music. Copper is a very dark sounding drum and has a lot of weight and dry overtones. The snare wires are a vital component of the snare drum and provide the distinctive snap that the drum is renowned for. The crisp sound is made by strands of coiled wire that is stretched across the resonant head with a desired level of tension. The snare wires vibrate against the resonant head when the batter head is struck and this is what creates the famous snare sound. The tension of the snare wires against the resonant drumhead has a huge effect on the sound produced by the snare drum. Loose tension will create a lot of rattle and buzz from the snare wires when the drum is hit, creating a darker and wet sound. Tight snare wire tension will create sharper and more articulate sounds. 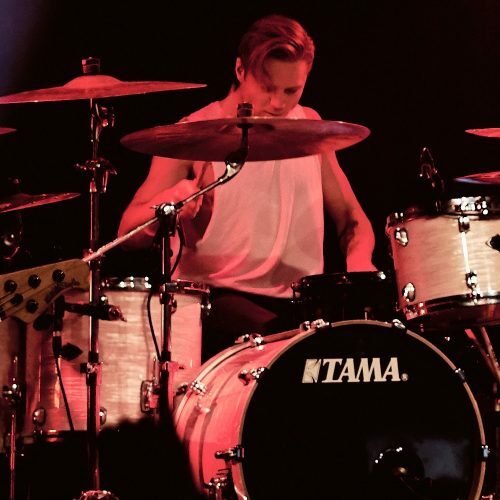 It is down to the drummer’s preference to choose a desired tension, and generally will be a well-balanced intermediate tension. Snare wires are available with anything between 8 to 42 wires, and most popular snare drums will have between 12-24 wires. More wires will add articulation and sensitivity to the snare drum, allowing for a greater snare playing response. But this isn’t to mean less wires is worse, it all depends on the musical situation. Snare wires are often made from chrome-plated steel but snare wires can be constructed from many different alloys that will affect the sound. Lugs allow you to tune your snare drum to your desired tuning and pitch. The more lugs a snare drum has means the greater control you have to tune over the entire tension of the drumhead. 10 Lugs is desirable for a snare drum and it is expected on all high-end snare drums. Recently more mid-range snare drums have been accommodating 10 lugs to match the high quality features of the flagship ranges. The snare drum is a drummer’s main weapon; it drives the music and defines a drummer’s sound behind the kit. It is the most versatile part of the drum set, delivering powerful grooves as well as articulate and pronounced fills within music. I am pleased to be able to offer you my 7 most highly recommended snare drums on the market right now, all of which are excellent options for various budgets and all offer a high level of performance, sound and well-rounded versatility. 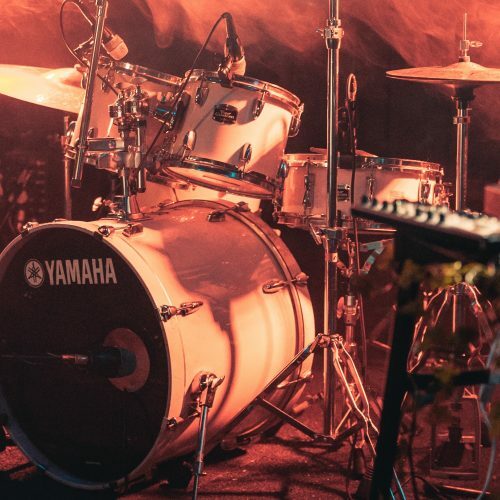 Whether your budget allows for you to buy a top of the range Ludwig Supraphonic Snare Drum or a Yamaha Stage Custom Snare Drum, you can guarantee that both offerings deliver great value for their respective budgets. The high quality construction and shell composition of all of the snare drums on this list offer excellent tuning ranges and a well rounded balanced sound that permits them to be used in a broad range of musical styles.